All the important parameters of a spherical triangle have been derived by Mr H.C. Rajpoot by using simple geometry & trigonometry. 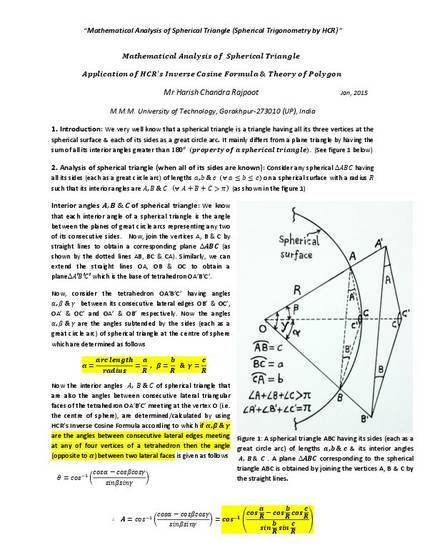 All the articles (formula) are very practical & simple to apply in case of a spherical triangle to calculate all its important parameters such as solid angle, covered surface area, interior angles etc. & also useful for calculating all the parameters of the corresponding plane triangle obtained by joining all the vertices of a spherical triangle by straight lines. These formula can also be used to calculate all the parameters of the right pyramid obtained by joining all the vertices of a spherical triangle to the center of sphere such as normal height, angle between the consecutive lateral edges, area of base etc.